Esse grupo de estudo online discute formas de sobreviver a “noite escura” do Brasil. 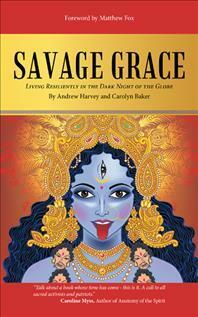 Será um estudo do livro “Savage grace: living resiliently in the dark night of the globe” (Graça Selvagem: vivendo de forma resiliente na noite escura do globo”), que oferece algumas estratégias para viver de forma resiliente na noite escura da terra. O estudo é online, gratuito, e aberto a todos, sempre começando as 19:30, mas sinta-se a vontade para entrar ou sair na hora que for. O livro pode ser comprado para kindle no amazon. Além disso, a autora Carolyn Baker, tem uma lista de artigos, podcasts e outros livros que abordam o assunto. Infelizmente, todo o material está em inglês. 11/12/2018 (terça)- Cap 4 – Regeneração: o legado do amor em ação. 19/12/2018 (quarta) – Cap 5 – Celebrando a reconexão, resistência, resiliência e regeneração. Os encontros terão a parte expositiva gravada mas as discussões não serão gravadas, como forma de preservar a privacidade dos participantes. Participação especial: @Diogo Lopes, Prema Avatar Das, vai falar sobre Kali, a deusa da morte indiana e arquétipo representado no livro sobre o momento que vivemos no planeta. Bate-papo: compartilhamento de emoções no pós eleição. Isso agrega para a situação? O que vc vai dizer é melhor que o silêncio que o substitui? Eu escrevi essa proposta de um Manifesto a Transição para a Grande Virada, a formação de uma “Frente Ampla dos Sonhos” uma proposta para tornar obsoleto essa sociedade dual. Essa a minha contribuição….nesse momento no que eu penso colocar a energia. Pouco tempo depois da eleição de Donald Trump como Presidente dos EUA, nós concordamos em escrever esse livro porque estávamos certos que as pessoas que começaram a se desepertar para a crise global, aqueles que já estão atentos a anos, e mesmo as pessoas que não conseguiram ainda metabolizar essa informação, precisariam desse livro. Enquanto ponderamos diversas possibilidade para esse título, escolhemos o título Savage Grace: Living Resiliently in The Dark Night of The Globe porque acreditamos que somente misericórdia (graça) selvagem pode nos conduzir nessa era e que resiliência é a estrela gyua de como devemos responder aos eventos terríveis e ameaçadores de nosso tempo. A definição de resiliência que preferimos é: A habilidade vital de mudar de uma postura reativa de negação ou desânimo para aprendizdo, crescimento e conquista em meio ao desafio. We must face that industrial civilization and its specific institutions totally dissociated from nature and indigenous wisdom are inherently traumatizing in ways we hardly recognize because we have lived with them for so long. We recommend further reading on the issue of trauma in industrial civilization as articulated by Judith Herman, Bessel van der Kolk, Peter Levine, and Gabor Maté. Any serious study of trauma in our culture quickly reveals that trauma is so pervasive and so normalized that we may easily miss that one of its central features is inevitably a dangerous obsession with certainty. How could it be otherwise in a culture that has provided us no sacred containers with which both to endure and to work with the potentially transformative nature of chaos? And yet, in our crisis of the global dark night, it is precisely this obsession with certainty that fuels catastrophe and makes almost impossible the creation of a new path that responds authentically to constantly shifting and explosive situations. Such a path cannot be wholly predictive, comforting, or clear-cut. It must embrace at all moments, paradox, ambiguity, and the prospect of extreme events and circumstances that compel wholly new alignments. In this book we will speak about what we believe to be the potentially different stages of the unfolding crisis. In each stage, even the last, terminal one, we will suggest appropriate and helpful tactics. We know at this stage of our evolution that there dwells in us a force of awareness, truth, love, and commitment to service that will not be shaken by whatever happens. Our hope is that by the end of reading this book, you will not only be awoken to the severe truth of what’s going on, but inspired to discover in yourself that Self that has never been born and will never die and that lives in a subtle and calm joy that no circumstances, even the most terrible, can destroy. The Reconnection, Resistance, Resilience, and Regeneration that we are going to celebrate in this book, arise from this Self and return to it. Our vision of resistance and activism does not depend on hopeful outcomes. It depends only on a resolute commitment to uphold, honor, and implement the dignity and consciousness of interrelationship that arise from the Self. Let’s get real and face together the likelihood that the human race now has two possibilities before it: An extreme crisis that leads to the survival of a bedraggled and traumatized remnant in a vastly degraded world, or the total annihilation of that world. We can never rule out, of course, the possibility of a sudden evolutionary leap in humanity or even miraculous divine intervention, but we would be narcissistic fools to count on them. We have come to the current situation because we have drunk a deadly cocktail of illusion. Our only hope now, rugged though it is, is in daring to live beyond the need for any kind of magical thinking—beyond, in fact certainty of any kind. We must take complete responsibility for the horror we have engendered and for the response we are now called to make to that horror, whatever happens. Such a response demands of us something far deeper than what conventional religions and visions of activism call for–nothing less than living and acting from the Self, both without illusion and totally committed to compassion and justice even, if necessary, in hopeless situations. In this dark night of the globe, we have come to understand that four crucial strategies must be employed not only to survive the dark night, but to inhabit our bodies and our lives with passionate authenticity, honesty, vigilance, community, compassion, and service. These strategies are Reconnection, Resistance, Resilience, and Regeneration. First of all, it is imperative that we understand how we arrived at this tragic juncture in the history of our species. We believe that our predicament is a result of profound disconnection—from our sacred inner wisdom, from all other living beings as a result of our delusional belief in separation, and from Earth and the reality that we are not only inherently connected with Earth, but that in fact, we are Earth. Thus, the first strategy must be a commitment to Reconnection. Secondly, we must discern the nature of the myriad enemies of mind, body, and spirit with which we are being confronted in the current milieu and learn strategies of Resistance in order to take a stand in the Self for transparency and integrity in the face of massive assaults on our fundamental humanity. Thirdly, we must cultivate extraordinary physical, emotional, and spiritual Resilience in order to navigate the plethora of dangers and uncertainties with which we are incessantly confronted. Resilience is an essential life skill that we have now to fine-tune both amid the turmoil of our daily existence as well as the monumental, explosive uncertainties we increasingly encounter in our communities and our world. And finally, we must commit to living lives of Regeneration in all of the stages, even in what could be the terminal one. Even if humanity is destined to vanish, those of us who are awake to the responsibilities of love will work to ensure as far as possible that we leave the planet still just able to sustain and evolve new life. As with Sacred Activism and the work of cultivating a vital spiritual path for our lives, what matters most is not the outcome of our efforts, but rather, our inmost intention. This needs to be stated clearly at the outset: we can no longer solve the global problems of this time at large-scale levels: poverty, economics, climate change, violence, dehumanization. Even though the solutions have been available for a very long time, they require conditions to implement them that are not available: political courage, collaboration across national boundaries, compassion that supersedes self-interest and greed. These are not only the failings of our specific time in history; they occur in all civilizations at the end of their life cycle. This is a bitter pill for activists and all people with discerning, open hearts. We understand the complexity of global problems, we have thought systemically to define root causes, we have proposed meaningful solutions, but we are impotent to influence those in power who ignore our efforts. Who do I want to be in this devastating time? Who must we be together as we navigate the dark night of the globe?